You’re having your kid’s friends over for a birthday party and you don’t want to use your everyday dishes, but buying single-use paper or plastic plates doesn’t sound appealing either. Our solution? Try Bambu’s Bamdino Veneerware. The collection is made from certified organic bamboo, and while they are disposable, you can likely get a few uses out of them before you dump them in the trash. They’re especially perfect for any prehistoric themed parties since they are etched with a dino design. Plus, the coordinating Bamdino utensils are cleverly shaped like dinosaurs, too. You're having your kid's friends over for a birthday party and you don't want to use your everyday dishes, but buying single-use paper or plastic plates doesn't sound appealing either. Our solution? Try Bambu's Bamdino Veneerware. The collection is made from certified organic bamboo, and while they are disposable, you can likely get a few uses out of them before you dump them in the trash. 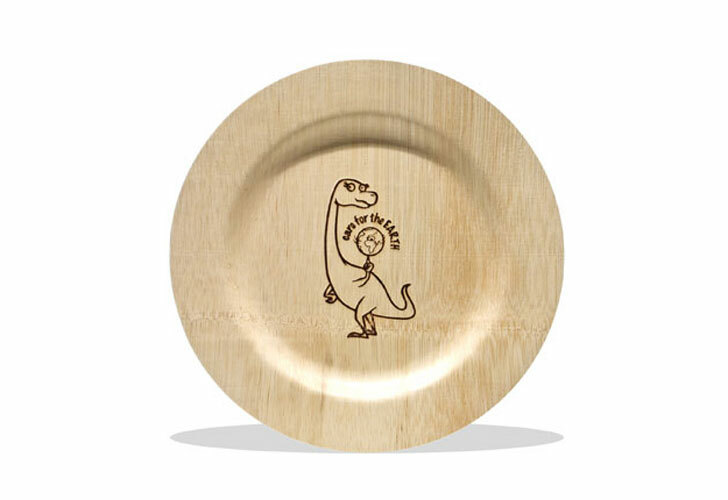 They're especially perfect for any prehistoric themed parties since they are etched with a dino design. Plus, the coordinating Bamdino utensils are cleverly shaped like dinosaurs, too.